Pan (pan, Greek Πάν) is a moon of Saturn, named after the god Pan. It was discovered by Mark R. Showalter in 1990 from analysis of old Voyager probe photos. Pan is within the Encke division in Saturn's A Ring; it acts as a shepherd and is responsible for keeping the Encke gap open. Its gravity produces wave patterns in the rings that indicated Pan's presence and led to the reexamination of Voyager photographs of its predicted location. Other undiscovered moons may exist within Saturn's rings. 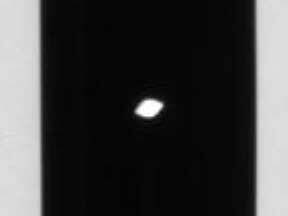 The existence of such a moon in the Encke division was first predicted by Jeffrey N. Cuzzi and Jeffrey N. Scargle in 1985. Then Showalter et al. inferred its orbit and mass in 1986 by modeling its "wake", or gravitational disturbance. They arrived at a very precise prediction of 133,603 ± 10 km for the semi-major axis and a mass of 510×10−12 Saturn masses, and inferred that there was only a single moon within the Encke gap. The actual semi-major axis is 133,583 km and the mass is 2.7×1015 kg, or 4.7×10−12 of Saturn's mass of 5.688×1026 kg. After the discovery it received a temporary designation S/1981 S 13. It is also designated as Saturn XVIII.